Other reviews of Caldecott books: 2008 Caldecotts, 2009 Caldecotts, 2010 Caldecotts. I had only read Interrupting Chicken when this year’s Caldecotts were announced, partly because the other 2 books were very difficult to find. They were on lists of contenders I was trying to read, but bookstores and public libraries didn’t seem to stock them. So after the awards were announced I finally broke down and bought my own copies. 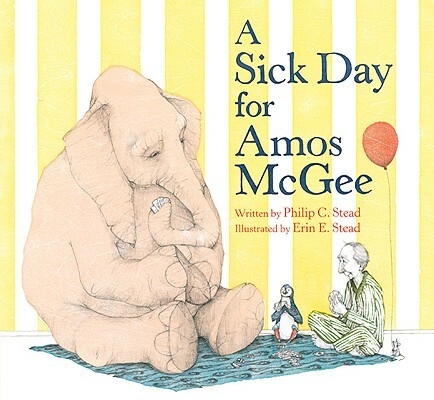 A Sick Day for Amos McGee, written by Philip C. Stead. Illustrated by Erin E. Stead. I’ve already blogged about how much I positively adore this year’s winner, but I can keep going. This is the kind of book you can imagine reading to your kids one day, and then your grandkids, from the first page. At least it was for me. From the second I saw those bunny slippers next to quiet Amos McGee’s bed, I knew this was a keeper. The details that Erin Stead has included here are so personal, so above and beyond for such a simple story, that you can look at them repeatedly and always discover new things. I think Amos McGee is a sad-eyed widower. My mom thinks he might be developmentally challenged, warm-hearted and full of routines. But we were both thinking about who this gentle man is. And the other characters are equally fascinating and charming. The shy penguin is a particular favorite of mine. And I even love the bus driver. When you see that rabbit reading the paper on the bus, and the driver doesn’t even bat an eyelash, you know this is a good bus driver. Such a perfect, whimsical book for children. 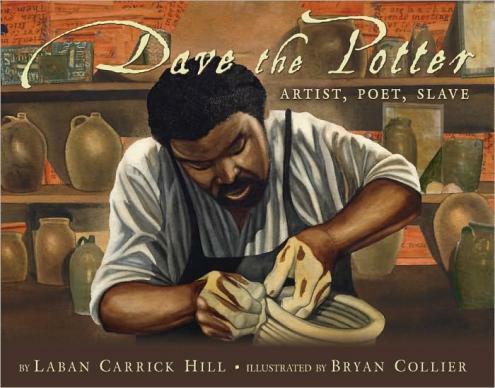 Dave the Potter: Artist, Poet, Slave, written by Laban Carrick Hill. Illustrated by Bryan Collier. I read this book over and over, taking in Hill’s poetic text and the absolutely incredible art by Bryan Collier. I love Collier’s illustrations anyway, but here, with a muted palette like the colors of the pottery, it really sings. And it’s the kind of story that must be true, it’s too interesting to be fiction. Dave was a South Carolina slave in the 1800s who made pottery for 7 decades, occasionally carving poems he’d written into the clay. No one knows how he learned to read, a rarity among slaves. Not every jar he made had a poem, and the notes at the end of the book suggest there were times when it would have been far too dangerous for him to do it. But the poems are powerful, funny, and surprisingly revealing in just 2 or 3 lines. The afterword contains several of them, complete with his punctuations and spellings, and it’s incredible to imagine this man making pottery for so many years, carving his thoughts into the clay. He was known for making huge pots, a skill most potters didn’t possess. This is a great biography of a real artist, and Collier’s collage and watercolor approach emphasizes that. It’s powerful. 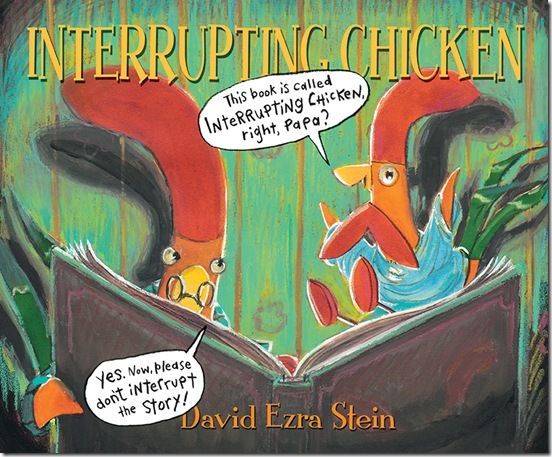 Interrupting Chicken, written and illustrated by David Ezra Stein. This one is the only one I’d read before the awards were announced, and I thought it came out of nowhere to get the Honor. Not that this is a bad thing, because this book is just plain fun. Poor Papa chicken is trying so hard to read little chicken a bedtime story. We can see how peaceful, calm, and serene the sepia-toned bedtime stories are. We can also see just how awake the interrupting chicken is when she bursts into each story in technicolor. She warns Hansel and Gretel, she soothes Chicken Little, and she makes Papa just a little bit crazy while he tries to get her to listen to the fairy-tales he reads to her. I love this book because it will make any adult who has ever tried reading to an excitable young child laugh out loud. It’s a miracle if I can get through a story at school without an interruption, and I thoroughly enjoyed Papa turning the tables, telling his daughter to write her own story, and then falling asleep, snoring, through the middle of it. Ha! It’s 2011 in the Library!